Most of today’s SUV and crossover models are available in several trims, some of which include an optional performance package with fancy rims, roof rails, and tow/winch assemblies. However, many buyers are hesitant to pay the premium price for these up-level models. Money can be saved through the purchase of aftermarket products, installed by the owner or a licensed auto detailer. Before choosing to upgrade the vehicle with aftermarket parts, careful consideration should be given to how the installing of these products may affect the warranty. The accessories and parts referenced in this article here outline the most popular customized parts. They can really enhance the appearance and functionality of the SUV but make sure they don’t invalidate a manufacturer’s warranty. Regardless of the vehicle’s size, wheel choices on new SUVs are somewhat limited. Nearly all models come with wheel sizes between 17-20 inches. The usual rim is alloy, with a 5-spoke option on the up-level trims. Some larger SUVs such as the Chevy Tahoe, Cadillac Escalade, and Infiniti QX56 offer 22-inch wheels. Online rim manufacturers and distributors have detailed information on their websites regarding custom rims for crossovers and SUVs. The smaller SUVs often have narrower wheels and cannot be fitted with ones that are much wider than the originals. However, larger models can handle the wider custom rims that offer better response to the front and rear suspension. Lift kits are available in several different styles. Some are designed to lift the entire body while others focus more on the suspension. There is no question that the proper lift kit can greatly enhance the appearance of a mid- to full-size crossover or SUV, giving it a formidable stance on the roads and improved off-road ability. Lift kits can be ordered directly online or through a specialized auto detailer. These kits range in price from $800 for a standard kit to more than $2,500 for a full-body unit. Specialty products such as add-a-leaf, lifted coil springs, and lift blocks can be purchased separately or as part of an entire custom suspension or body kit. The lifting of an SUV should be carefully considered as it adversely affects fuel economy and can make the vehicle more prone to rollovers. A good quality winch instantly transforms an SUV into a fully functional heavy-duty vehicle. Winches can really come in handy when operating an SUV off-road such as for hunting or fishing, allowing vehicle owners to free themselves or other vehicles from thick mud or other pitfalls. Winch kits vary by rating according to their overall power. Ratings are generally listed as between 6,000-16,000 pounds. Front-mounted winches are easy to install. Careful consideration should be taken concerning the actual model of the SUV, however. The winch must be properly mounted with the appropriate hardware, and the unit must not be placed in such a manner as to cause eventual damage to the front end of the vehicle. Fancy grille guards are an attractive way to spruce up the appearance of an SUV. Most of the custom grille guards currently on the market are made from stainless steel and are available with chrome or black finish. These brush guards are fastened to the lower section of the front end and have extensions that completely cover the headlamps. 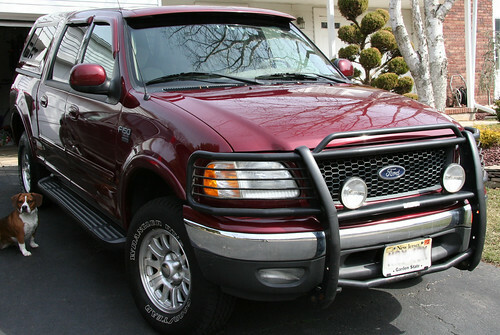 Fog lights can be installed as part of the grille cover. Some SUV models have a design that allows for the installation of fog lamps as a replacement for the factory lights. Vehicle owners should check the available units for compatibility before removing existing headlamps. Most of the current SUV models have a performance package that includes roof racks, or the up-level trims will have these as part of the standard equipment. Buyers can save money by installing aftermarket products, but consulting with an experienced body shop mechanic or car detailer can be a wise move to have the job done right. Roof racks are easy to install. The main concern is the drilling necessary in order to place the assembly bolts for the rails and crossbars. If the model does not come with hidden hole locations, the car’s warranty may be invalidated. Check with your installation professional on warranty issues. This article was provided by the team at www.freecarinsurancequotesonline.com helping drivers find affordable coverage for their vehicles.